I can make you a video production to really enhance your sales or funding potential. Delivering a fun, informative and beautifully shot short that you can use in your media campaign. Video is a great way of creating and keeping interest in your brand. Delivered so you can embed in your website or post online, videos have quickly become one of the best marketing mediums. Easily shared and if crafted creatively an easy way to get your message across to the people who are most important to you. We have made many films to show products and explain a business from opening shorts for a modern web page to in depth product features. From initial consultation to ready to embed product can take as little as 10 days. Fill out the form below, add some details about your needs and I will reply quickly. under £1000 in most instances. 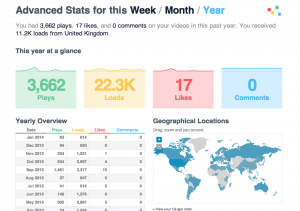 Here are viewing figures for the last year on my Vimeo channel– 22,300 loads! Have a look at my last few films to get an idea of my style. An initial consultation costs nothing. A proposal, price breakdown and proposed schedule is then created for your agreement. Filming is generally possible in a day depending on circumstances and editing over 3 to 4 days.